The creator of jewellery so exquisite that it leaves his admirers breathless with wonder and admiration, and this is just one of the reasons why Nirav Modi is deserving of the title of diamantaire extraordinaire. Barely four summers ago, he burst upon the international scene with an auction at Christie’s Hong Kong, his Golconda Lotus necklace fetching $3million. Subsequently in 2012 Nirav Modi improved his own score, when Sotheby’s Hong Kong auctioned his diamond necklace for $5.1million. Listed as one of India’s youngest billionaires, Nirav Modi remains a very reticent, humble person, who would rather avoid all human contact, preferring to communicate via emails. But then the man is continuously creating masterpieces in his head, so he needs solitude to dream up his wonders. That he has the soul of an artist, is reflected in his magnificent two storied new boutique in Mumbai, which is designed by Spanish interior designer Jaime Hayon, along with the outlets in Delhi and New York. But it is his office that almost resembles an art gallery, which probably provides the perfect ambience for him to create. 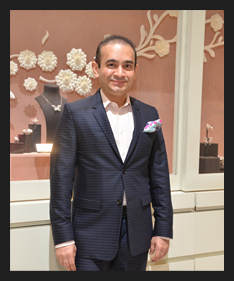 In an exclusive Q&A for The Luxury Chronicle, I have tried to decode Nirav Modi, the artist who is a jeweller. Who is the real Nirav Modi and what drives his designing? I am perpetually in the quest for excellence and I am continuously learning along this journey. The enduring ethos that drives my designing is that fine jewellery must feel a part of you, floating off the ears, caressing the neck, embracing the wrist. My inspiration is always the woman who will adorn the jewel – it should move with her every movement. The movement in our jewels also lends a play of light, bringing out the best sparkle of the jewel. This makes the jewels light-weight and more fluid. 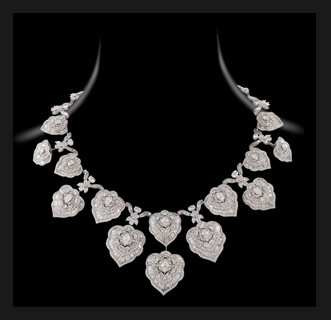 The Golconda Lotus necklace, which was auctioned in Nov 2010 in Hong Kong for $3mil, had a 12.29 K Golconda diamond. Since your jewellery is often making headlines at auctions, do you design your more expensive pieces with such auctions in mind? It actually works the other way round. We source the best diamonds available and then design the jewels keeping in mind the best way to showcase these exceptional stones. The Golconda diamond was a rare gem, in fact, I would say it was a once-in-a-lifetime stone. With nirav modi bresletthis diamond in mind, we sourced the finest stones that would complement its rarity and innate beauty. Thus, the Golconda Lotus Necklace was born. At NIRAV MODI we use the highest quality diamonds not only for our auction pieces but also for our fine jewels —there is no compromise in any aspect of jewellery designing, diamond sourcing and crafting the jewel. Every jewel, be it a masterpiece like the Golconda Lotus Necklace or a simple solitaire ring, witnesses the same kind of loving dedication to perfection. We source rough diamonds from Russia and South Africa, which are then cut and polished at our own factories in Russia. This has also given us the ability to be creative with our diamond cuts. Diamonds are such special tantalizing gems and we strive to create jewels that maximize their lustre by reducing the metal used. With the Endless Cut™ for instance, you just see one seamless halo of diamonds, the Ainra Cut™ replaces the metal links traditionally used in jewellery and the Mughal Cut was developed to ensure that each flower petal could be a whole, undisturbed diamond. Your jewellery is very beautiful in its delicate settings. Do you have an in-house design team? We do have an in-house design team. When I have an idea or inspiration, I am able to conceptualize the jewel in my mind. I do not draw, but I write a detailed poetic narrative on the jewel for our designers. We go through several rounds of alterations and changes, before we finalize the design and crafting of the jewels. The inspiration comes from myriad sources – art, architecture, mythology and nature. Apart from this, I screen and select each stone that makes it into a NIRAV MODI jewel. How much of your own creativity is used towards the actual design process? Everything from ideating to sketching, making gouaches (water colour rendering of the jewel as it would appear, once finished), to creating mock-ups that give us an idea how the jewel will look and sit on the body takes place in a systematic order, and I am involved at each stage to ensure my vision takes life. What is ‘luxury’ for Nirav Modi? Luxury must embrace, not intimidate. Personally, for me, luxury is excellence personified; it is a filter through which I view all my design goals of creativity, artistry and comfort. Did your decade at Gitanjali Gems working 6½ days a week teach you anything? My time with Gitanjali taught me a lot of things. It was a privilege to have had the opportunity to experience different parts of a business whether it was jewellery design, retail or marketing and management. Even more important was the mentoring I received by my uncle, Mehul Choksi. His passion, his commitment towards every aspect of the business, his vigour and work ethic left an indelible impression on me early in my career. What is so special about the Endless Cut band? The Endless Band is a seamless halo of diamonds set with a specific number of Endless™ Cut diamonds, cut and set in accordance with the wearer’s finger’s size. The specialized setting, known as the Enigma™ setting, creates a seamless halo of diamonds without any metal visible on the surface of the ring, maximizing its lustre and sparkle. Both the cut and the setting have been globally patented by us. When we first came up with an ‘all-diamond’ jewel with no metal visible, the general consensus was that it couldn’t be done. 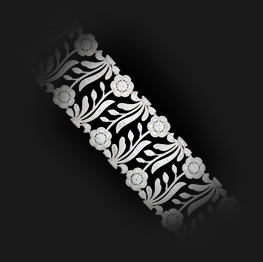 What is special about this jewel is that each Endless Band has to be created especially for the wearer, depending on their exact specifications. The diamonds for each band have to be cut and set according to the wearer’s requirements. 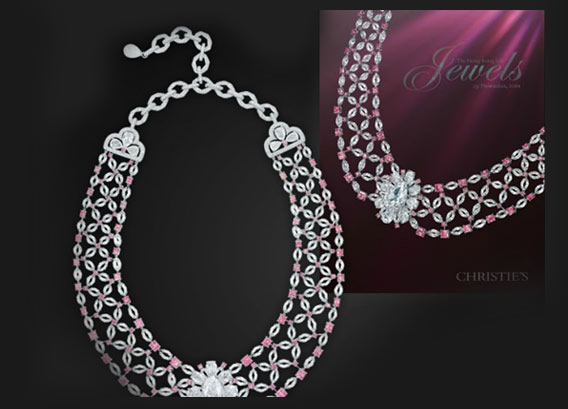 It is the ultimate in bespoke jewellery. The particular diamond cut and setting conveys the concept of continuance, timelessness and signifies eternity in relationships, truly defining ‘forever’. Like the elastic bands your daughters were playing with inspired your bracelets. Are there any other everyday inspirations for your jewellery? Monet’s Water Lilies first captivated me at the Metropolitan Museum of Art, NY, later when I visited Giverny all of Monet’s art came to life in its gardens for me and inspiration for the Lotus Collection was born. Similarly a painting by the late Gond artist Jangarh Singh Shyam that hangs in my cabin at our Mumbai office triggered inspiration for the Bodhi Cuff. Here the artists’ signature elaborate forms consisting of a series of lines and studded points are interpreted through the medium of gold and diamonds. The story of the seagull in “Jonathan Livingston Seagull” by Richard Bach, its learnings about life and flight, and its quest for perfection, inspired the craftsmanship of the Feather Ring and thereafter, the creation of a collection around it. Depicting strength through the spine, and gentleness through the feathers, the jewel has a graceful flow of the silhouette and goes over two fingers. Do you prefer creating collections like other jewellery brands or do you prefer one of kind pieces? Although we do have one-off pieces, all our jewels belong to collections inspired from different genres. 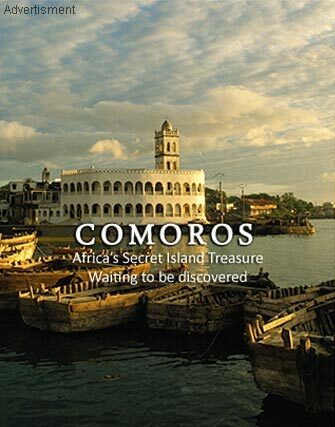 Each collection has a story to tell and a distinctive characteristic that sets it apart from the others. 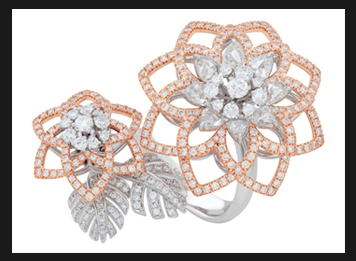 For instance, the Sunburst Collection is inspired by the art deco movement; the Scheherzade Collection is inspired from the Arabian tales of One Thousand and One Nights, the Lotus collection symbolic of the revered and beautiful lotus blossom. The Luminance Collection is also one of our collections and this is an endeavour to capture something as abstract as light and its intensities. 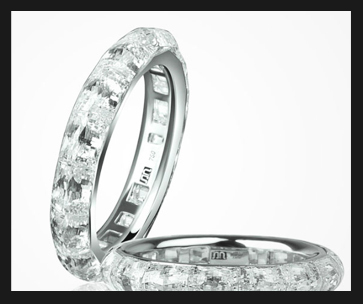 Carefully handpicked diamonds in different cuts, sizes and shapes create brilliance with beautiful depths and patterns. Integrating this melody of light and luminosity with human emotions, the collection also symbolizes the different stages of life spanning youth through maturity. What are your innovations in jewellery design? A lot of our efforts have been focussed on minimizing the amount of metal used in our jewellery. For instance, patented cuts like the Endless Cut™ where you just see one seamless halo of diamonds, the Ainra Cut™ replaces the metal links traditionally used in jewellery and the Mughal Cut™ was developed to ensure that each flower petal could be a whole, undisturbed diamond. Other innovations centre on creating comfort and movement with our jewels. 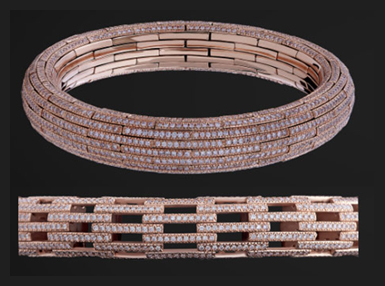 The engineering feat that backs the Embrace Bangle ensures a comfortable fit for any wrist size and easy wearability. Our endeavour is to make jewels become a part of the woman wearing them and move with her every movement. It takes 550 hours to design and build a Rolls Royce, while our Scarf Necklace took 1500 hours! I know it is hard to believe but that’s what we strive for, to create timeless jewels. The Scarf Necklace can be folded into the palm of your hand just like fabric, but when worn, caresses the neck of the woman presenting a beautiful necklace. 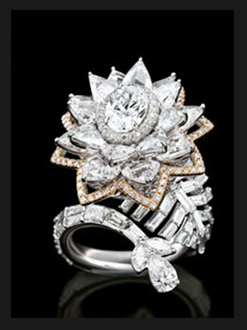 Fine jewellery must maximize the innate lustre of diamonds and we do this by minimizing the metal used. This is done specifically for two purposes: with minimal metal, the diamonds are in the spotlight, bringing their brilliance and fire to life and it makes the jewellery lighter and therefore a lot more comfortable for the woman to wear. Have any jewellery designs of the past influenced you? Suzanne Belperron was someone whose work I particularly admire, but I wouldn’t say it has influenced me in terms of jewellery design. Reading, collecting art and travelling; apart from these, Japanese teas are also a passion. How do you relax? With a good book and a light brew of my favourite tea. You wanted to become a music conductor what changed your mind? I don’t think there was a defining moment or reason that changed my mind. The change was so gradual and the transformation from sourcing rare diamonds to creating fine jewellery was a serendipitous journey. There was a three strands large emerald necklace with diamonds in your store during the opening. Will it be auctioned or is it for sale and if so why? We haven’t decided on that yet. How many pieces do you make in a design? Our fine and high jewellery collections have distinctive pieces within each category. Apart from large statement pieces and rare solitaires we have a wide range jewels that can be worn every day. Accordingly, a collection can have anywhere from 2 to 20 different pieces in it. You also have a New York outlet. Will all the three outlets – Mumbai, Delhi and New York have the same designs or will they be city specific? All three boutiques will have carefully curated pieces from high jewellery and fine jewellery sections. The Mumbai boutique features many of our iconic collections such as the Celestial, Luminance and Embrace in addition to other collections featuring everyday jewellery. We realise the need to go beyond large jewels that are only worn at occasions to precious jewels for every day, and this is the philosophy that will be evident in all three stores. Our clientele has been very supportive and appreciative with our Delhi boutique and we are committed to ensuring that they will be equally enthused about the Mumbai boutique. Apart from our existing iconic collections, the New York boutique will also have a wide range of solitaire rings and the newly launched Embrace Bands in keeping with the preference of the bridal segment in the US. This range will have solitaires in four specialized settings that grant them distinction and unique identities as bridal jewels – Tulipe; Signature Solitaires; Ribbon and Celestial. Which other gems besides diamonds do you like to work with? I like emeralds for their depth of colour, individuality and versatility. Are you a moody designer or a 9 to 5 one? I am a designer who needs to be constantly in touch with my artistic side. Reading, travelling and keenly observing my surroundings and the people within it ensure I am never short of inspiration.